View More In Steamers, Stock & Pasta Pots. When it's time to strain, it can be such a pain. You splash and spill your pasta everywhere. Not anymore! introducing the Gotham Steel non stick pasta pot - the revolutionary pasta pot! 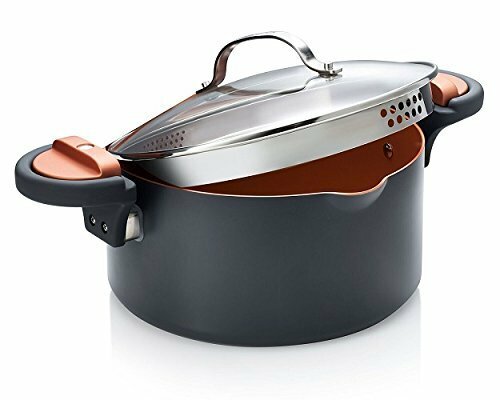 Gotham Steel pasta pot is the revolutionary, 5-quart or 4 quart pasta pot complete with a lock-on lid that doubles as a smart strainer. The tempered glass lid has large holes on one side for draining larger foods like potatoes and ravioli, and small holes on the other for smaller foods like spaghetti and vegetables. Just lift and lock and you'll get a steady pour like never before! it's that easy! plus, with the Gotham Steel copper-infused, scratch-resistant surface, you can boil and mash potatoes in the same pot! even cheesy chili mac is no match for the Gotham Steel pasta pot's non-stick surface.